Whether you’re still thinking of buying the Canon G1 X or you already own the camera, nothing beats reading the owner’s manual cover-to-cover to get a comprehensive understanding of operating the camera, camera settings, features and the available range of functionality. 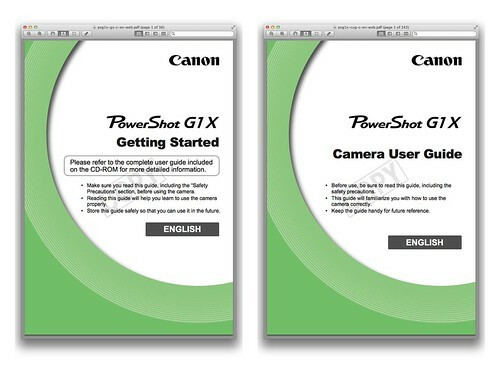 Canon PowerShot G1 X — Getting Started – 1.18 MB, 36 pages. Canon PowerShot G1 X — Camera User Guide – 15.64 MB, 242 pages. If the direct download links didn’t work for you, visit Canon USA’s official Brochures & Manuals page for the G1X and download from there.